Published May 16, 2018 at 12:05 a.m. Updated May 16, 2018 at 6:52 a.m.
Darrius Simmons, a 17-year-old Warren junior at Warren G. Harding High School has captured attention across the country with his ability as a classical pianist, appeared on NBC Nightly News with Lester Holt on May 15. A crew from NBC filmed it at Harding High on Monday. 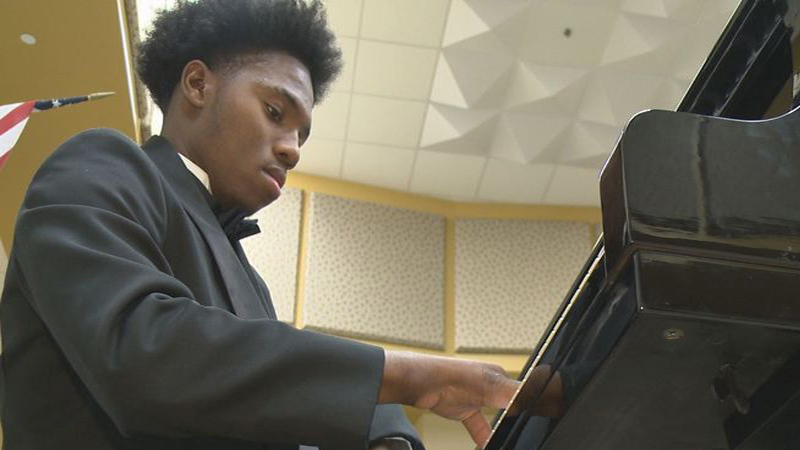 Darrius Simmons, a 17-year-old junior at Warren G. Harding High School has captured attention across the country with his ability as a classical pianist, appeared on NBC Nightly News with Lester Holt Wednesday, May 15. A crew from NBC filmed it at Harding High on Monday. Darrius Simmons, the Warren teenager who has captured attention across the country with his ability as a classical pianist, appeared Tuesday night on NBC Nightly News with Lester Holt. The 17-year-old junior at Warren G. Harding High School appeared at the end of the news broadcast. A crew from NBC filmed it at Harding High on Monday. What sets Simmons apart is the fact he has mastered the instrument despite being born with only four fingers – three on his right hand and one on his left. Simmons’s skill and passion have been known for a while. In 2016, he was invited to perform at Carnegie Hall in New York with Korean pianist Yiruma. More recently, a song Simmons composed, “Dreams Are Forever,” went viral on the internet, receiving 3.9 million views in little more than a week. Simmons said he was shocked when he learned of his song’s explosive popularity. “It took me by complete surprise,” he told The Vindicator’s broadcast partner, 21 WFMJ-TV. He said it was Yiruma who encouraged him to write his own songs. The melody for “Dreams Are Forever” came to Simmons while he was thinking about life. Despite his disabilities – he was also born without bones below his knees and plays the piano pedals with prosthetic legs – Simmons is making the most of his gift for music. He plays keyboard in Harding High’s marching band, trombone in its symphonic band and piano in its jazz band. When he graduates next year, Simmons hopes to get a scholarship to pursue a degree in music. “I don’t ever get discouraged. I’m glad I have inspired people and made their day,” said Simmons. May 15, 2018 10:49 a.m.
June 3, 2016 12:08 a.m.
June 2, 2016 9:55 p.m.
June 19, 2015 12:05 a.m.